A Form View is an alternate view of your primary form, as seen when you are working in the Form Designer. You might, for example, use a form view to display an alternate language version of your form, or a compact version of your primary form. A form view shares the same submission database with the primary form (all submissions go into the same database), and can only include fields that already exist in your primary form. Respondent Update Mode - You can use a form view to present what a user will see when returning to log in and edit their submission. With this second view, you may find it easier to make decisions about any changes that might be necessary in the primary view. DataViews / Record Details View - When creating a DataView, one of the options available is to use a form view as the Title and Some Text record details display template. If you choose the form view option, you can create a simple view for record details. This may be convenient if there are many fields you want to hide from view when browsing and editing records in your database. In the Form Designer Toolbar, click the arrow in the Form View menu, and then select Create & Manage Form Views. In the Form View Wizard window, click the Next button to proceed. Accept the default choice (Start with a copy of the Primary Form), or choose to start with a blank canvas. Click Create New Form View. The wizard will close and, in a few seconds time, the tab in the Form Workspace will have the name of the view that you specified in the wizard. 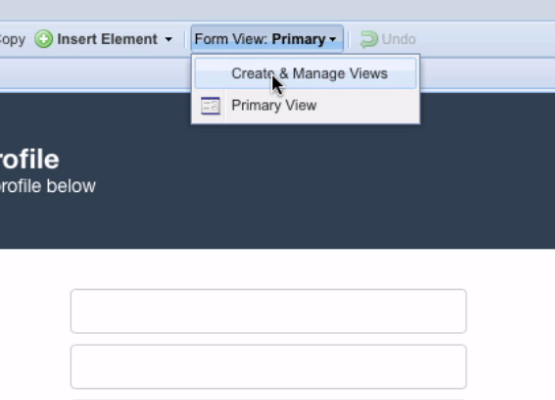 Note: Though a form view may only contain fields that exist on your primary form, you can display a field on the form view and hide the field on the primary view.